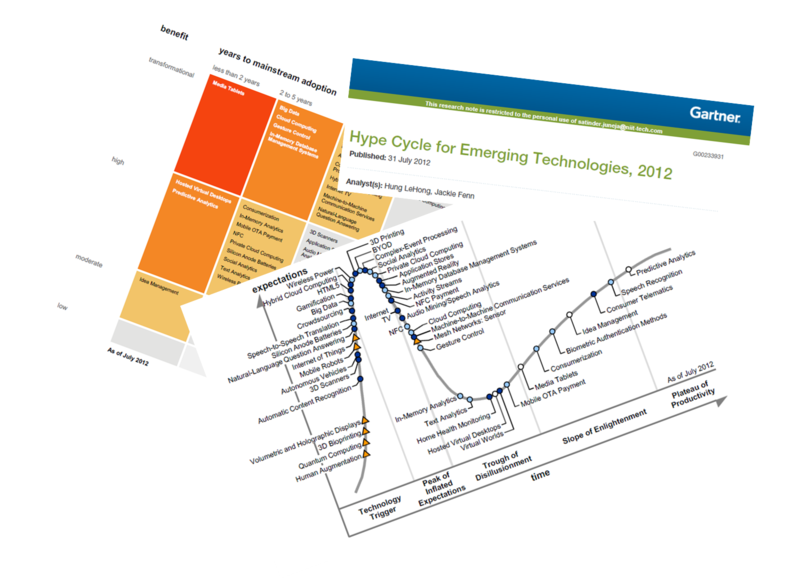 Here is a summary of the Gartner Hype Cycle for “Emerging Technologies” for 2012 – what is stated explicitly, what can be inferred. This Hype Cycle is suppose provide insight into emerging technologies that have broad, cross-industry relevance, and are transformational and high impact in potential. 48 technologies are listed in this year’s hype cycle which is the highest in last ten years. Last year they had 42 – year 2008 was the lowest (27) – year 2005 was the previous highest (44). We are at an interesting moment — a time when the scenarios we’ve been talking about for a long time are almost becoming reality. Which macro trends are stated explicitly in the report? The Human Way to Interact with Technology – speech, gesture etc. What Payment Could Really Become – NFC, Mobile OTA etc. As you may know, Consumerization of IT describes the trend where technologies are adopted by consumer ahead of enterprise & government. Hyper-connectivity is about connecting everything us-to-internet; things-to-internet; peer-to-peer; consumer-to-enterprise; enterprise-to-enterprise… and so on. What is “Consumerization” doing in the list of technologies? It is not a technology – it is a trend. Is AI and Robotics nearing the Tipping Point? For years both AI and Robotics have promised a lot but the reality has been far removed from the promise. Are we finally reaching a stage where we will see all the Sci-Fi turn into reality? Here is a glimpse of the status of Robotics today. What about technologies for improving efficiency or for reducing cost? …6 technologies listed under this category! Clear indication that we have reached a level of saturation on how much improvement we can achieve by just looking inwards. Why has “Idea Management” appeared in the hype cycle for last 6 years and “Agile Methodologies” have never found a place? After all both are process / methodology and you will agree that Agile has much larger impact and adoption than Idea Management. What about the Priority Matrix? Only technology listed under “Transformational impact in next 2 years” is Media Tablet, which is the term Gartner uses for iPad and other similar tablets. Is the impact of cloud computing ever going to be transformational? How consistent is this year’s hype-cycle compared to previous years? As you can see from this table – it is much more consistent compared to previous years! Interesting write up ! I think NFC as a technology is not going anywhere though mobile payment is slowly evolving with players like Square. Growth of NFC is limited by the additional infrastructure required at both ends and the mobile payment space is fragmented with lot of players joining alliance , forming their very own implementation . Tough times ahead for NFC while other form of mobile payments look promising. And with the recent move of Facebook going for the native iOS based mobile app for faster performance, it would be interesting to see what other mobile app developers would be thinking ? They may go for native iOS there by leaving the growth of HTML 5 at least in mobile space suspended for quite some time !